A.P. Kensey is the author of Young Adult action/fantasy novels. 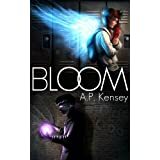 "Bloom is an engaging, well-written action-packed YA contemporary fantasy novel. It tells the stories of two young people whose lives are changed by their discovery of superhuman powers that they are struggling to understand and control, and who have both been touched by personal tragedy. [...] The characters are well-developed, believable, real and different, and the suspense in the story is a real page-turner. I would certainly look out for more in the series by the same author." Please enter your email address and click the Follow button to follow A.P. Kensey!